Goerz/Ross/Cargill/Horizon/Ardent Flour Mill on E. Broadway, Newton. Operation dates: 1918 to present. Construction of the Goerz Flour Mills began in 1918. 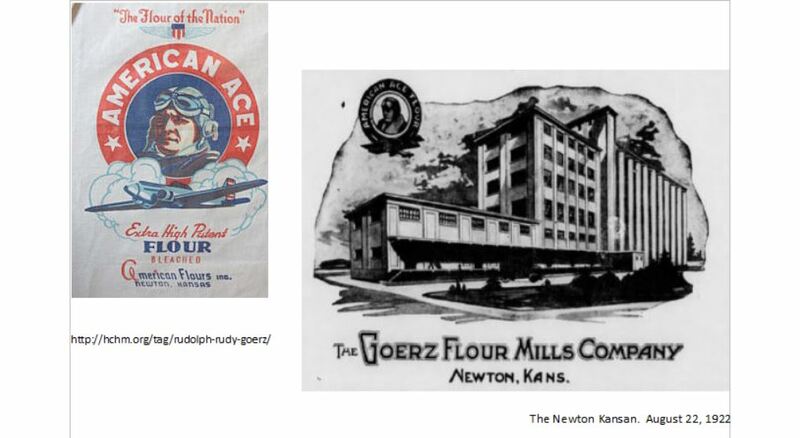 By the end of the year, the first American Ace flour was produced. Rudolph “Rudy” Goerz was the president and general manager. Active in the community, Goerz was the first president of the Newton Rotary Club, a member of the Newton Chamber of Commerce and served on the Newton City Council. In the early 1920s, Goerz sponsored a plane to advertise his “American Ace” flour. The plane had an emblem of a flour bag painted on its fuselage showing a pilot’s head with helmet and goggles. To promote the flour, pilots Eddie Rickenbacker and Dillard Kennell flew the plane all over the United States. Rudy, the son of David Goerz (one of the founders of Bethel College), operated the mill until 1938 when he withdrew from the milling business due to serious illness. Paul and G. Murray Ross bought the mill in 1936 and operated it as Ross Industries until selling out to Cargill in 1974. Further changes resulted in Ardent Mills as the current owner. Photo Sources: http://hchm.org/tag/rudolph-rudy-goerz/ and The Newton Kansan. August 22, 1922.